Before booking make sure to check-out also car rental agencies such as Holiday Autos, PaylessCarRental and Auto Europe, as you might get a better deal there. Expedia UK offers a £100 discount code for flight + hotels packages consumed until the end 30 June 2015. Since Venere.com is a part of Expedia group (including also Hotels.com), it means that this Venere promo code allows you to save money on the same hotels that you could book on Expedia and Hotels.com. The Venere coupon code is valid for travel until 31 March 2015. This Venere voucher code applies only to bookings paid online (not to those where you pay at the hotel). InterContinental Hotels just launched a new promotion available for booking until 27 March 2015. Each Friday, a selection of Holiday Inn, Crowne Plaza, Indigo and InterContinental hotels will be sold with a 50% discount, for stays any day of the week until 6 April 2015. Remember to check back every Friday, when the list of hotels is updated. We found a simple method to get significant discounts at this 5-star property in Athens, Greece. This is done by using the Best Price Guarantee offered by Radisson. In short, this says that when you book a room directly on the Radisson official website and, within 24 hours after booking, you find the same room cheaper elsewhere, Radisson will honour the smaller price reduced by 25%. Let's take this example: for the night of 19 June 2015, the standard room is sold at 160€ on the Radisson official website. For the same night, booking.com offers a price of 115€. This means that after you submit a successful claim, your room rate will drop to only 86€. If, for some reason, booking.com doesn't offer a cheaper rate, check the room rates on HotelsCombined, to see which other online travel agencies offer a lower price. See our article about the Best Price Guarantee from Radisson to see exactly how to proceed, step-by-step. Try this method only for flexible rates, which can be cancelled free of charge, to avoid the risk of paying too much for your room. This must be RatesToGo's Christmas gift. Available for bookings until 28 December 2014. The RatesToGo voucher code must be typed in on top of the payment page, in the section "Promotion code", just above the credit card information. TravelPony, one of our favourite hotel discounters, offers 40% saving on rooms at the Hotel de Tuilerieen**** in Brugge, Belgique. You need to have an account with TravelPony to take advantage of their offers. If you do not have an account yet, use this link to create one and you will receive a 35$ credit to use on your first booking. Be sure to use promo code TPSAVINGS at check-out. 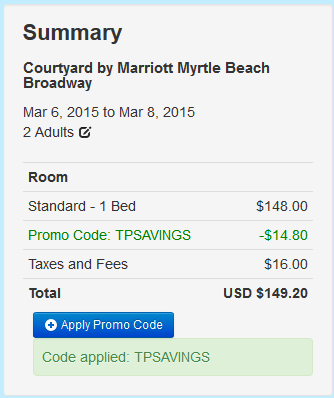 TravelPony, one of the best hotel discounters, offers a 50% saving on rooms at the Courtyard by Marriott Myrtle Beach Broadway. For example, 2 nights over the week-end 6-8 March 2015 have a total price of 150$ on TravelPony, while all the large travel agencies price the same room at over 300$ (search them all with HotelsCombined). Great deal from Roomer, a new discounter which allows individuals to sell the non-refundable hotel rooms they booked elsewhere, but which, because of various reasons, they cannot use (e.g. because of sickness). Currently there is a room including breakfast at the Novotel London West selling for 65$ for the night of Friday, 5 December 2014. A special opening rate at teh Moevenpick Hotel in Koh Samui, Thailand. The discount is 40% compared to the best available rate. The offer requires a 4 night minimum stay. Available for booking until the end of 2014 for travel throughout 2015. Free breakfast is included in this special rate. These rates are non-refundable, so book only if your plans are firm. ebookers Switzerland (part of Orbitz group) offers a 200 CHF promo code for hotels located in selected ski resorts in Germany, Austria, Swizerland and France . A minimum 5 night stay is required to benefit from this offer. The promotion is available for bookings until 31 March 2015, with travel until 30 April 2015. The code is not valid for international hotel chains or for rates which are paid directly at the hotel.